College basketball's regular season is fast approaching an end, and the drama that comes with it is amping up tenfold. Across the country, conference races are tightening (looking at you, ACC), streaks are on the brink of being broken (staring intently with eyeball emojis your way, Kansas! ), and game results that may typically be off the radar suddenly have heightened NCAA Tournament implications. A bad loss can spell doom, and just as well, a quality win can earn you favor among your resident Bracketologist. From now until Selection Sunday, you should be hearing those oft-discussed buzz words you hear every year in the college basketball lexicon: Phrases like on the bubble, or strength of schedule, or Quadrant 1 wins. You'll probably be reading more Jerry Palm than ever, too -- as you should. So with just over two weeks until Selection Sunday, there's no better time than the present to reassess each league race across the country. It's crunch time. So let's look at the major conferences first, followed by the other leagues. Outlook: Houston has a stranglehold on the league. It has a conference-best 13-1 record, good for a cushy one-game lead over 12-2 Cincinnati. But there's drama to be had, potentially. If Cincy wins its next three, it will be 15-2 going into its season finale against Houston -- and the game is in Cincy. Outlook: Virginia, Duke and North Carolina are all tied for first in the ACC with four games remaining for each contender; Florida State and Virginia Tech are 2.5 games back, so it seems to be a three-team race. And we might just have a natural tie-breaker built into the schedule: Duke and North Carolina, the latter of which beat the former this past week, face each other in their respective regular season finales on March 9. Virginia might be considered the favorite here for two reasons. No. 1: It has lost twice all season, both times to Duke -- and Duke is not on its remaining schedule. And No. 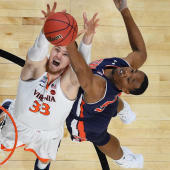 2: Virginia's schedule (according to the latest AP Top 25) doesn't include a currently ranked opponent. Outlook: Kansas's win over Kansas State on Monday night keeps the Jayhawks and their streak of 14 consecutive Big 12 titles afloat -- for now. But in-state foe K-State remains the co-favorite with a Big 12-best 11-4 league record; the other co-favorite, Texas Tech is 10-4 and should win with ease against Oklahoma State on Tuesday to match the Wildcats atop the league standings. Kansas needs to win out and get both to stumble to have a chance, and Baylor, 9-5 in-conference, probably needs to win out and get some help. The Bears have the most difficult remaining path with road trips to Kansas State and Kansas in their final four games. Iowa State needs to win out and get some help. Outlook: We may have gotten our must-watch Big Ten game of the year this past weekend when shorthanded Michigan State went into Ann Arbor, Michigan, and came out with a road W. The win gave Sparty a leg up in the league, and with three games remaining, it holds a half game advantage over Purdue. But this isn't just a Michigan battle -- Purdue has worked its way into the conversation by winning 11 of its last 12 in league play, including a win over Sparty in late-January. Michigan is one game back, Maryland is two and Wisconsin is 2.5. Outlook: It's down to two: Marquette and Villanova. And the way 'Nova has played of late, it might be down to one. The reigning national champion Wildcats have lost four of its last five in league play after a 10-0 start, and now sit at 11-4 -- 1.5 games back of Marquette. The two play each other Wednesday, which affords Villanova to gain ground -- or Marquette to all but put a bow on it. Outlook: Perhaps the most intriguing conference race of all. This is a total toss-up. Kentucky is playing its best ball, having won 13 of its last 14. LSU has been a giant killer, knocking off Kentucky, Auburn, Mississippi State and Tennessee all this month. And Tennessee has been Tennessee -- it was 23-1 before losing to Kentucky last week and to LSU this past weekend in an overtime game that could've gone either way. Outlook: Barring a complete collapse, Mike Hopkins and his Washington Huskies are going to win the Pac-12 for the first time since 2011-2012 -- the first year the Pac-12 included Colorado and Utah as league members. The Huskies are 13-1 in the league with a 3.5 game lead and only four remaining games on the schedule. Arizona State would need to win out and also need UW to lose out, and, well, now we're getting into some pretty unrealistic hypotheticals. America East: Vermont has just about wrapped up the America East for a third consecutive season. It sits at 12-2 in the conference overall with a 1.5 game lead, and has just two games remaining -- both at home. Atlantic 10: There's three bona fide contenders in the A10: VCU, Davidson and Dayton. VCU has a one game lead at 12-2 over Davidson, which sits at 11-3. Dayton's on the outside looking in at 10-4, but with four games remaining, they aren't out just yet. Atlantic Sun: Lipscomb has a .5 game lead over Liberty with one game left to play, but Liberty has two left. We could be headed for a tie if Liberty can bounce back from its weekend road loss to North Florida. Lipscomb and Liberty split the regular season series. Big Sky: Even after falling to Northern Colorado on Monday, Montana still has a one game lead in the Big Sky with three games left. Road games at Portland State and Sacramento State loom as potential trap games for the Grizz as it looks to close out the regular season. Big South: The NCAA's leading scorer this season, Chris Clemons, has Campbell a game out of first-place in the Big South standings. Radford stands in the way, though. Fortunately for us, we get a Campbell-Radford showdown on March 2 in the league's regular season finale that could determine the winner. Big West: UC Irvine is 2.5 games up on Cal State Fullerton in the Big West, and one win away from securing the top seed in the league. It plays Thursday against UC Davis, which it beat 71-69 in OT back in January. Colonial Athletic Association: Hofstra is clinging to a one game lead over Northeastern at 13-3 overall in the CAA, but it has lost two of its last three -- the lone win in that span coming over Towson in a double-OT thriller. Road tilts at Drexel and Delaware for both Hofstra and Northeastern only adds to the suspense. Conference USA: C-USA is Old Dominion's to lose. With three games left, the Monarch's hold a 2.5 game lead over UTSA and a three game lead over UAB, Western Kentucky and Southern Miss. Horizon League: Wright State holds a one game lead with two to play over Northern Kentucky, but both are tough roadies against Milwaukee and Green Bay. Northern Kentucky has an equally (literally) challenging slate ahead, with road games against Green Bay and Milwaukee on tap. Ivy League: Harvard's buzzer-beater to lift the Crimson over Yale this past weekend shakes things up in the Ivy, but Yale is still clinging to a one-game lead in the league standings at 8-2 -- both losses coming in conference play to, you guessed it: Harvard. Metro Atlantic Athletic Conference: Drama, drama, drama. Iona's at 11-6 in the MAAC, leading the league. But Quinnipiac, Rider, Siena and Canisius are all one-half game back. Iona-Rider on March 1 will be appointment-clearing television. MEAC: Norfolk State can lock up the MEAC this week when it plays Coppin State and Delaware State -- two teams it has already defeated by double digits earlier in the season. Trailing closely is North Carolina A&T only 1.5 games behind, but it might be too little, too late for the Aggies after falling to Norfolk State on the road two weeks ago. Mountain West: No. 12 Nevada remains the favorite to win the Mountain West, but its lead isn't comfortable. It currently stands at 12-2 with four games remaining, only a .5 game lead over Utah State, who it plays on March 2. Mid American Conference: No. 21 Buffalo is in the catbird seat to win the league for a second consecutive season. The Bulls are 12-2 in the MAC, which gives them a one-game lead over Bowling Green with four games left on the schedule. The two contenders play March 8 in a rematch from a Feb. 1 game that Bowling Green won the first time around. Missouri Valley: 2018 Final Four darling Loyola-Chicago remains a contender to get back to the 2019 NCAA Tournament. The Ramblers are in a three-way tie for first with Drake and Missouri State, and each has two games left to play. Drake and Missouri State's meeting in the season finale on March 2 could be a dandy. Northeast Conference: St. Francis (Pa.) is 11-5 in NEC play, but it slipped up this past weekend to LIU Brooklyn to decrease its lead to just one game. Fairleigh Dickinson and Robert Morris are officially within striking distance, and the league-leading Red Flash finish their season on the road at Wagner and at Sacred Heart. Ohio Valley: Murray State has a future top-5 pick in Ja Morant and a 14-2 conference record to boot. Belmont, meanwhile, has a future NBA player in Dylan Windler and it, too, has a 14-2 record. Each has two games remaining on its schedule. Patriot League: Ray Bucknell! Ray Bucknell! With two very winnable games left on tap, and with a one game lead in the Patriot, the Bucknell Bison are expected to win the league for the fifth consecutive season. Ray Bucknell! Southern Conference: No. 24 Wofford hasn't been beaten in the SoCon. It has a perfect 16-0 record in league and has already clinched the top seed in the postseason tournament. Southland: Sam Houston State opened its season at 4-8. Now the Bearkats are 19-9 overall, 14-1 in the Southland and on the verge of officially wrapping up their first conference regular season title since 2009-2010. It is up three games over New Orleans in the league standings. Summit League: South Dakota State is 13-2 and ahead of Nebraska Omaha in the league by just a half game. If the Jackrabbits take care of business Saturday, it will finish the regular season with a 14-2 record; Nebraska Omaha has two games left and if it does the same, it will also close at 14-2. Both Nebraska Omaha's games remaining are on the road -- at ORU and at Denver. Sun Belt: Texas State's got a one game lead with three to play, but Georgia State and Georgia Southern are both lurking at 10-5. The Bobcats' final three games are on the road, so a chance for some surprising developments over the next few weeks are high. Georgia State at Georgia Southern on March 9 is shaping up to be a massive one. SWAC: Prairie View A&M holds a two game lead over Texas Southern with four games left on the docket. Saturday it starts a two-game road trip to Alabama, where it faces Alabama A&M and Alabama State. West Coast Conference: No. 1 Gonzaga has been so dominant in the league this season that it already clinched the WCC last week with a win over Pepperdine -- which came with three regular season games left on its slate. Western Athletic: New Mexico State has already captured the top seed in the WAC postseason tournament. The Aggies are 12-1 in league play with three games left.